gThankYou! Pie Gift Certificates are a fun and valued employee gift! Good for any brand of pie, cake, cheesecake or similar items — fresh from the bakery section or frozen. Why share the gift of a pie? Pie is the traditional all-American treat, "as American as apple pie." We share pies at the holidays, on picnics and parties, and as a special treat. Besides being a delicious indulgence, pie means something. It’s patriotic. Making a pie is a labor of love. Pie symbolizes togetherness, love, comfort and family. Everyone loves pie! What are Pie Gift Certificates? gThankYou! Pie Gift Certificates are good for any brand of pie, cake, cheesecake or similar items — fresh from the bakery section or frozen. Recipients redeem their pie vouchers at major U.S. grocery store chains. gThankYou! Pie Gift Certificates work as Manufacturer Coupons, just like the cents-off coupons everyone is used to redeeming. They are good for any grocery store pie, cake or cheesecake purchases in budget-friendly denominations of $5 and $10. Watch our two-minute video to the right and learn how gThankYou makes meaningful gift-giving easy, convenient and affordable — at the holidays or any day! gThankYou! Pie Gift Certificates are the economical and convenient way to share pie gifts in your workplace or place of business. Share your Pie Certificates as standalone gifts, or with gThankYou! Ice Cream Gift Certificates for an “à la mode” treat. Pie vouchers also make great add-on gifts during the holidays — combine with gThankYou! Gift Certificates for a Thanksgiving Turkey, Christmas Ham, or Groceries to share a complete holiday meal. When’s the best time to share pie? Anytime, if you ask us! A Pie Certificate is an easy way to share a meaningful holiday gift that everyone will appreciate and enjoy. Let your recipients choose their favorite holiday dessert to share with family and friends — pumpkin, pecan, apple, banana cream, even cheesecake. It’s a perfect workplace holiday gift! Thank your employees with pie! Employee Appreciation Day is always the first Friday in March. Pie Certificates are easy to send to remote workers so they feel the workplace love, too! Looking for fun, offbeat opportunities to celebrate employees or customers? Pie is a great excuse to celebrate! Pie is so popular there’s a day to honor it: January 23. Pie vouchers also make great party favors for a workplace celebration of Pi Day on March 14.
gThankYou! Pie Gift Certificates are a patriotic treat to share on the 4th of July, especially as a way to thank employees who are working on the holiday. No picnic is complete without a fresh pie! July is National Picnic Month: give the always appreciated gift of pie certificates for recipients to redeem for their next family picnic. The most effective recognition happens as part of an "ongoing conversation" with employees. Empower your managers to thank employees on the spot for excellent performance with the unexpected delight of pie gifts. When you recognize employees right away, the benefits start right away. gThankYou! Pie Gift Certificates are good for cake, too. Wish your recipients “Happy Birthday!” with a birthday cake gift certificate. Pie gifts are the perfect way to show your customer appreciation. Thank loyal customers with a token of gratitude that will please everyone. Anytime is a good time to show appreciation, and anytime is a good time to eat pie. Put them together and what do you get? Smiles all around! How do I order Pie Gift Certificates? Order online or call us at 888-484-1658. It’s easy and convenient! Virtually all gThankYou orders ship the same day they’re received. If you have a large organization or many locations, we are happy to create a customized plan for you with volume pricing. Call us to learn more. What does a gThankYou! Pie Gift Certificate look like? 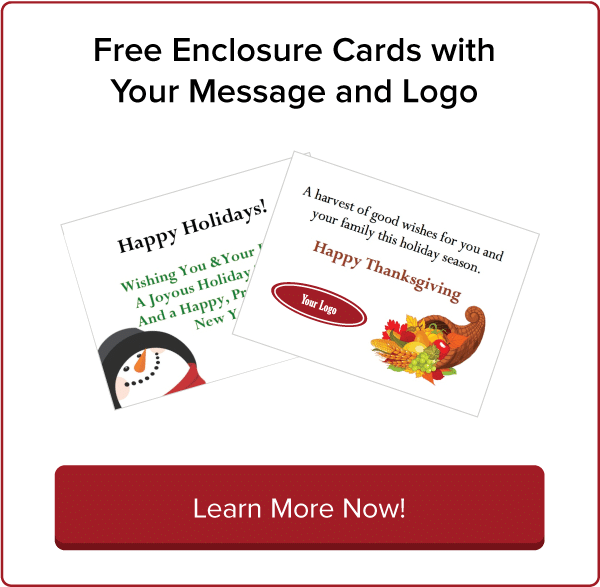 Add FREE gift Enclosure Cards, personalized for you! All gThankYou Gift Certificates come with customizable Enclosure Cards with room for your personal message and organization logo — all free! gThankYou has dozens of Enclosure Card designs to choose from, including a Pie-specific design as well as designs for every season and holidays like Thanksgiving and Christmas. gThankYou offer more than Pie Gift Certificates! Choose from a variety of our popular food Gift Certificates perfect for workplace holiday gifts, anytime appreciation, wellness incentives and customer promotions. You select the variety and value that best fits your objectives and budget!